Captain Jack Sparrow is coming back to the big screen! 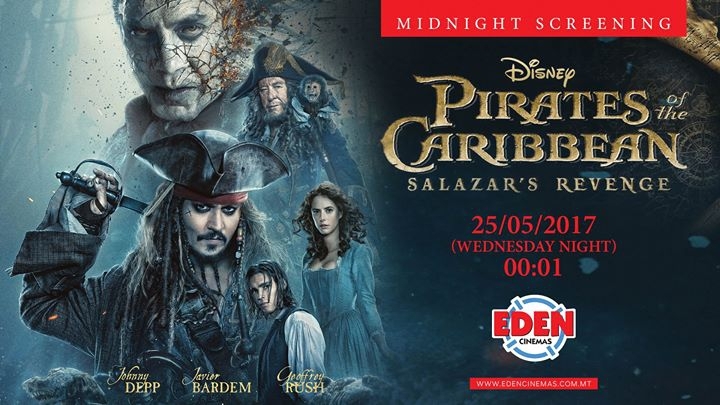 Be the first to watch his action packed adventure at the exclusive midnight preview of Pirates of the Caribbean: Salazar’s Revenge, at Eden Cinemas on Thursday May 25th (Wednesday night to Thursday morning). In this fifth instalment of the Pirates of the Caribbean film series, Captain Jack Sparrow finds the winds of ill-fortune blowing even more strongly when deadly ghost pirates led by his old nemesis, the terrifying Captain Salazar, escape from the Devil's Triangle, determined to kill every pirate at sea...including him. Captain Jack's only hope of survival lies in seeking out the legendary Trident of Poseidon, a powerful artefact that bestows upon its possessor total control over the seas.